So delicious, they won't be able to tell the difference! We've baked our famous chocolate chip cookies with rice flour for this gluten free treat. Send one to a favorite dessert lover on a restricted diet for a birthday, housewarming, or any reason at all. Oh. My. Goodness. I used to be jealous of my siblings' ability to eat whatever cookies my sister made on Sundays. Not any more. These cookies are better than the cookies my grandmother keeps stashed in her house and significantly better than even my homemade gluten free cookies. Not only are these cookies the perfect amount of sweet (in contrast to so many other gluten free snacks laced with so much sugar to mask odd tastes), they are completely void of the starchy odd flavor so many gluten free snacks have and are the best crispy cookie I have ever had. Be warned, the perfect taste and texture matched with the lightness of the cookie will make you want to never stop eating these snacks. Hands down best cookies i've ever eaten! Especially considering they're gluten free. Won't buy any other cookie. GF- can't even tell. Just be sure to get white bag. I've made the mistake of getting the green bag! 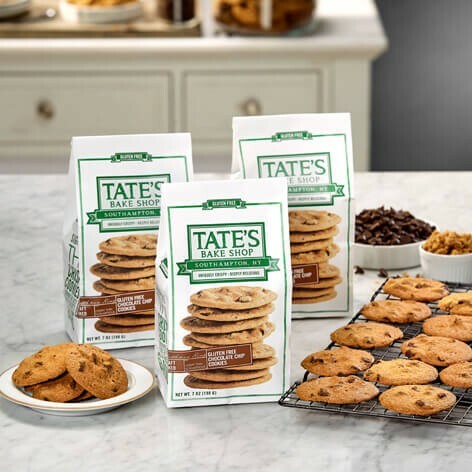 Tate's are it for me! I purchased these at the Marine Exchange store. They are AMAZING. I am excited about eating a cooking again. I will call to order a variety. Thank you. These cookies are thin and crispy and wonderful with a glass of milk! The best I have found in 35 years of being Celiac! Super tasty! Hard to stop eating them! The buttery caramel taste is so wonderful. 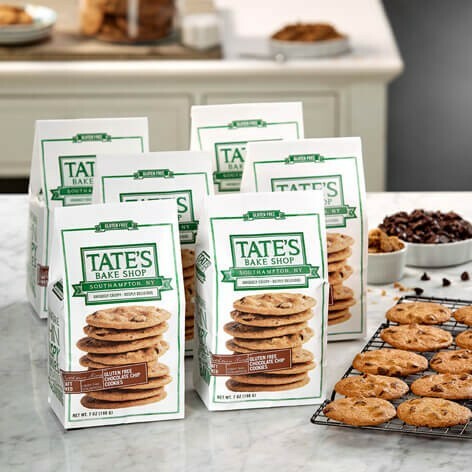 My brother gave me a box of these delicious chocolate chip cookies and I was hooked!!! I started to share them with other family and friends and they got hooked! They taste as if u just took them right out of the oven and let them cool for a few minutes. Yum!!! It's unbelievable how amazing these are. I'm gluten free, but my family is not. Yet they still insist on buying these cookies compared to every other non-GF brand at our grocery store because they're THAT GOOD!! Love these cookies! I can't even eat other cookies now.. just Tate's! These are the best gluten free chocolate chip cookies I have eaten in my 10 years of having celiac disease. I stopped making my own chocolate chip cookies because I can have these delicious cookies without all the work! These are the most delicious cookies. I do not need to eat gluten free food but I choose these chocolate chip cookies over those with gluten. Yummie!